Okinawan sweet potatoes have buff skin and a deep purple flesh. They are earthy, delicately sweet and can be prepared in a variety of ways. This dish can be made Vegan by substituting the yogurt with Veganaise. Truly an exotic blend of flavors and so simple to prepare! 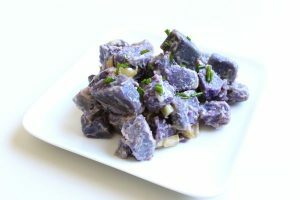 I first tried this potato salad in Hawaii and was taken by its exotic flavors. I replicated the dish as close to the original as possible. 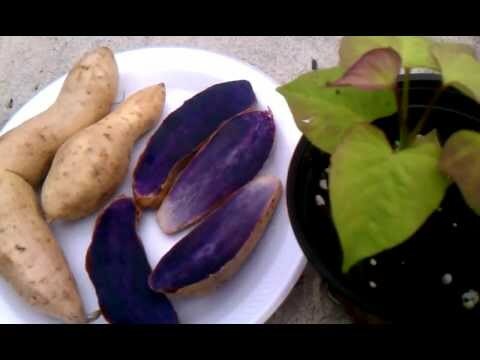 Locating Okinawa sweet potatoes can be tricky; they are pale skinned but inside they are a vibrant purple! Delicious!! I was able to locate some at an Asian market. 1. Mix the first 5 ingredients together with a whisk. 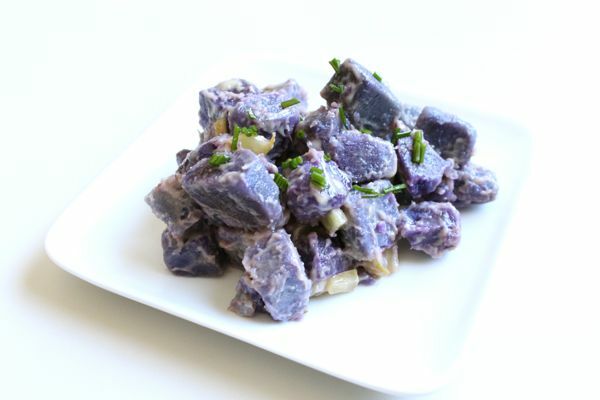 You may want to thin the mixture slightly with coconut milk to more easily coat the potatoes. 2. Taste and adjust the flavors until it suits your personal taste. 1. Roast or boil the potatoes until cooked. Do not overcook or they will become mushy. Cool, then refrigerate cooked potatoes until they are cooled through. This will make them easier to prep. 2. Meanwhile, slice up the celery and prep the onion and green onion. You want to add crunch to the salad, so keep the celery pieces bite sized. NOTE: To make crescents, slice the onion in half parallel between the root end and top. Cut one of the halves straight through the middle. Start cutting the quarter from the center to the edge of the onion in the thickness you desire. 3. Cut the cooled potatoes into desired sized pieces and add celery and onion. Mix together in a serving bowl. 4. Coat with the coconut cream-yogurt mixture and serve. You may also wish to drizzle some of the dressing over the salad just before serving.